In a little less than a week, I will return to Kansas City to attend the Cerner Health Conference 2013. It has been a year since my last visit when Cerner hosted the Partnership with Patients conference. People in the wider world of patient advocacy are still talking about that amazing event. For one weekend last September, Cerner’s educational building became a social media hub and epatient epicenter. We even trended on twitter in Kansas City. It was the kind of event that stirred hearts and minds. This year I will do something very different at Cerner. I will not moderate sessions of a patient conference. Instead, I will blog and live tweet. I, who have so long endorsed social media as a powerful voice in and of itself, will stick my courage to the testing place and prove that the online voice is just as powerful as any orator. Cerner is paying me as a keynote speaker, but my stage will be the internet. I look forward to seeing old friends and hearing new thoughts. I look forward to returning to the company that gave me my first speech with listening ears and a questioning mind. I shall tweet to @Cerner and with the hashtag #CHC13 and spread the word about innovation and new products in Kansas City. I will report debate. I will bring with me the questions that I hear at so many conferences regarding EMR systems. I will listen eagerly for answers, for I have never regretted attending a Cerner event. I cherish the knowledge I have gained while listening to those so willing to teach me when I was just known as Regina, the widow of Fred Holliday. Now I may be known as Regina the founder of the Walking Gallery, but I will listen to the wisdom of the staff at Cerner. Cerner invites patients to sit at their table. I can think of few venders who can claim the same. Now, I must admit it will be quite odd for me to sit back and focus just on writing when traditionally I do two or three things at once. But I think that this event will be an exciting one as things are rapidly changing in electronic health records as the measures of Meaningful Use march forward. Cerner Health Conference 2013 takes place October 6-9th and I will be there on the 6th and 7th. Due to a prior commitment I can stay no longer than those days, but I am sure that those hours will be sufficient to report out current Cerner projects. Happily, I will be able to chirp in with follow-up questions while on the road as @cerner is one of the most responsive corporate twitter accounts within health care. So dear friends and faithful readers, wish me luck, and follow me on twitter as I explain HIT content and health policy from Kansas City. Surely, you remember those days. The sleepless nights filled with cramming knowledge into tired minds preceded days of testing. We walked around in a caffeine-fueled daze; our pencils sharp prepared to fill little bubbles with darkness or scrawl endless essays. And so it went, through junior high and high school. The finals would come, time and time again. We would be tested. We would pass or fail. And if we passed, there would be more tests. College finals were a little different; we would download the content of our minds in essay fashion into a little blue book. I hated to write in a blue book, as my handwriting is abysmal. But beautiful or not, everything I knew was laid bare for my professor to see. I would pass or fail based on what I had managed to impart between these blue pages. Do you know Peter L. Levin? If you follow health policy matters, you might know he led health record innovations at the VA. His official title was Senior Advisor to the Secretary of Veterans Affairs. 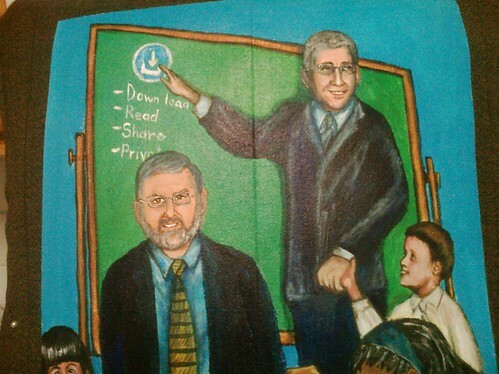 He was the executive sponsor of the Blue Button personal health record. He worked with White House on technology initiatives under both presidents George H.W. Bush and Bill Clinton. He co-founded a semi-conductor design firm. He is the co-author on 50-plus articles on wide ranging topics from GPS to engineering to cyber security. But most all, Peter is a professor. 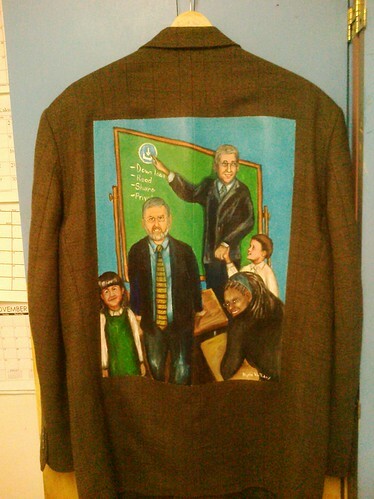 He joined The Walking Gallery in his favorite tweed jacket. He usually wears this jacket once a week and has for the past ten years. This is Peter as himself. All titles and accomplishments aside, Peter is a teacher and he cherishes those around him. 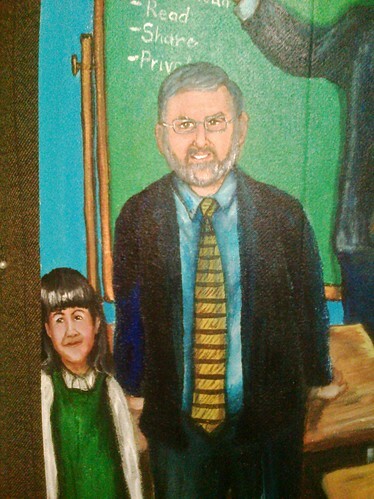 In this painting, Peter stands beside a rolling lecturer’s chalkboard. He is telling the class about the wonders of the Blue Button. In front of him and sitting on a desk is a member of his team: Jim Speros, Special Assistant to the Chief Technology Officer in the Office of the Secretary of Veterans Affairs. What is the Blue Button? Blue Button was born. The U.S. Department of Veteran Affairs adopted it first. It is a clickable icon that allows a patient to download their personal health records in a digital form from a secure website. The VA, Medicare and Tricare offer this service to thousands of clients. In June of 2012, a White House meeting convened proposing an expansion of Blue Button to other agencies, venders and insurers. Many organizations pledged to adopt this needed innovation. The Blue Button does have its detractors. This button allows for a data dump in a pdf or ASCII file. The data is not organized in a way that is easy for a layman to understand but is human readable. The data down load reminds me a great deal of my old blue books. It isn’t pretty, but it is the information needed to pass the test. And when we talk of patient data access this test is about life and death. Peter stands at the chalkboard lecturing to the class. He smiles as looks around the room. But he stands at a rolling chalkboard and everything can change in an instant. Have you ever lectured using one of these boards? They are double-sided. They are designed to easily flip over, allowing the instructor to write on the either side. Such boards will surprise you. I have found myself writing furiously on such a board only to watch it spin and turn. My writing will be replaced by another lesson. And so we go from Blue Button to blue alone. Blue is such an important color. For much of history, the color was synonymous with darkness. (Only recently, and only in America, do we sometimes associate it with healthcare.) Every new artist learns the lesson of blue when mixing color. To have the blackest black, the deepest shadow you must add blue. So we have sorrowful music and call it the Blues. When people fall into depression, we call it the Blues as well. 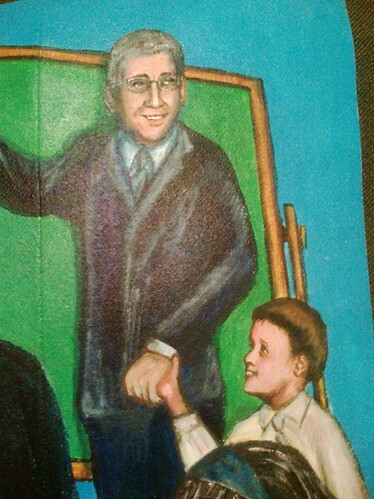 In this picture Peter holds the hand of his uncle Ronny. They grew up together as though brothers, with Ronny only ten years his senior. Peter loved his uncle Ronny and watched him battle with depression and mental illness through adolescence. Then Ronny died from cancer in his 20’s. 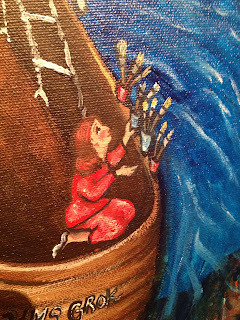 To the far left of the painting a young girl stands. That is Amanda Andrews on her first day of second grade. She seems so happy here. She seems so happy in so many pictures over the years. But in the summer in her 16th year of beauty and youth, Amanda killed herself. Her mother Kristen Andrews, is a friend of mine on twitter and works for Kaiser Permanente. She was at work at the time. She was in a meeting about health as her daughter died. In the foreground on the far right is Misha Head. I had the honor of being Misha’s supervisor at the toy store Barstons Child’s Play for a number of years. Misha had the best laugh. It would fill a room with joy. Often that laugh would hide a deep well of sorrow. Misha moved away from DC and decided to go back to school. She wanted to dive back into the world of blue books and chalkboards. But one day the well of darkness within her grew greater than her laughter. She killed her herself 2011. Finally we have Jim. Such a nice man, so kind to all of us in every meeting I have attended in on health policy. He sits upon the desk prepared to speak to us, prepared to move boulders out of the way of progress. Jim had such a nice smile upon his face to hide his sorrow. Peter was his friend and Peter was his supervisor. Jim killed himself last fall. Peter never saw it coming. Just as Kristen could not imagine she would lose her daughter during summer vacation. Just as I cannot believe I will never hear Misha’s laugh again. We sorrow, and then wonder why they did not share their deep despair with us. Why do we live in a culture where we can talk of Blue Buttons but not blue feelings? to Takoma Park (From a Model to a Rainbow, Sam Gilliam and Steve Frietch , 2011). Caitlin Carroll previews her documentary film on the murals of DC. In 1997 Perry Frank, Ph.D., initiated a project to document and showcase the outdoor murals created throughout the city beginning in the early 1970s. With a team of associates and advisors, she has photographed the murals; conducted oral histories of the artists and sponsors; authored text explaining the art; led mural tours; and organized public programs. 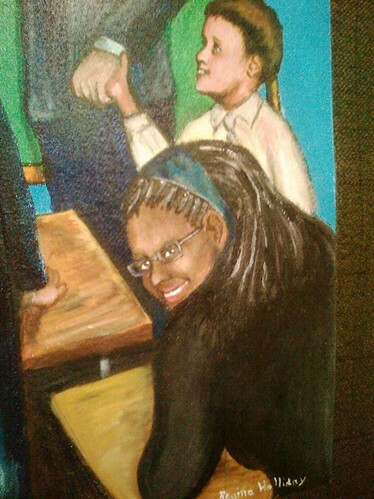 In 2010 she created a mural website, which currently displays 35 of the city’s greatest pieces (www.dcmurals.info). Dr. Frank is president of her own small business, American Dreams & Associates, Inc. The project is partially funded by the Humanities Council of Washington, DC, and the DC Commission on the Arts and the Humanities. I am very exited to tell you I will be speaking in Kansas City on September 12-13 at The University of Kansas Medical Center. This event is sponsored by the Center for Interprofessional Education. 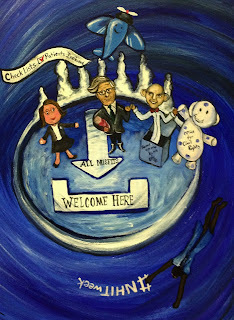 I met the KU interprofessional team at the Collaborating Across Borders event in Vancouver, Canada this past June. They were intrigued by my message of patient communication and were surprised how of my work much stems from family experiences in the Kansas City area and The University of Kansas. My Keynote speech is "The Eye of the Storm" and I will speak twice on Septemeber 12th. The title of my speech references the happy years my late husband Fred Holliday spent in Kansas as he pursued his doctorate degree and the years I spent managing the Art Dept. at the Jayhawk Bookstore in Lawrence Kansas. It was a lovely time compared to the maelstrom circling around us. We had no idea the challenges we would soon face in the world of healthcare and patient data access. You can register here to attend the speech at noon-1:00 and here to attend the speech at 3:30-5:00 on the 12 th. I also will be hosting a social media workshop entitled "When Art Is No Longer Just a Pretty Picture" on the 13th at noon-1:00 and you can register here and will also be live-painting onsite in the mornings. Last fall I was reading Sheryl Sandberg’s book “Lean In” on a plane. I looked around my aisle at seats filled with business travelers and the majority of them were men. As I read Sheryl’s thoughts on the fields dominated by men in positions of authority, I knew there was a field dominated by women: care giving. Over 80% of caregivers are women. We are wives, mothers, daughters and friends caring for our loved ones. We are the great silent majority that keeps healthcare on track, even if that track is worse for wear. Sheryl reminds the reader that to get ahead we will have to lean in. And we do. We lean into the nurses station demanding medication be delivered, as it is already late. We lean into the embrace that lifts a body from a bed into a wheelchair. We lean into the wall when the tears become sobs as arms empty of their task. I was very inspired by Ms. Sandberg’s book. Though I must admit quite a bit of that inspiration was attained through indignation. Her description of a working mother’s professional life supported by a successful spouse with paid staff to care for the children is not the reality most women face. We make many choices in this world and one of them is to love others greater than ourselves. That is the role of the caregiver. The caregiver spends so much of his or her life wrapped deeply around the life of another. When the object of that deep love and care is gone, life can seem so dark; yet we must go on. It is a very hard thing to let go of the life you lost and row away. I took my frustration and turned it into a song: "Lean In." I wrote the lyric and melody, and my friends Ross Martin, Marsha Goodman-Wood and Jeff Jensen would arrange the music, sing and master the final recording. They are amazing musicians and caregivers as well. 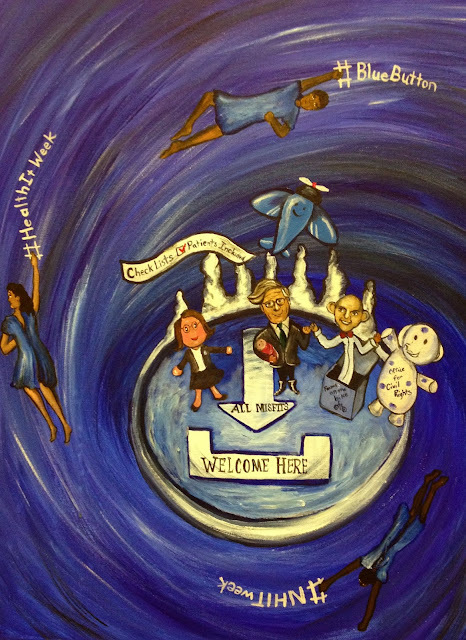 Here you can see art depicting caregivers as well as a recording of the song. The sound quality is a little rough and you can hear some automobile-like noise in the background, but I like it as that reminds me of painting 73 Cents on Connecticut Ave in DC. The video is a bit shaky at times, but so am I.
Won’t make it to the dawn. And yet I travel on. I swore an oath to take this journey. I said I’d serve but not obey. The captain of my ship is sinking. And yet I row away. I lean into the sorrow. I lean into the pain. We are the shelter in the storm. We were there when you were born. We lean into the sorrow. We lean into the pain. As we row against the waves.